IDGrab is an identification gathering and storage system that captures ID and thumbprint data from individuals. It was designed to assist nonferrous metal recycling companies with compliance of Michigan Act No. 429, the Nonferrous Metal Regulatory Act. However, it can be used in any situation where a company would like to associate a thumbprint or fingerprint with a specific transaction, a specific customer, or even just a swipe of a License or other ID. Effective April 1, 2009, Michigan Act No. 429 of the Public Acts of 2008 defines specific responsibilities for buyers and sellers of all nonferrous metals within the state. It applies to all "dealers" that are not "first purchasers" who purchase nonferrous metals from any seller. This includes scrap metal recyclers, scrap processors, secondhand and junk dealers, or any other person who purchases any amount of nonferrous metal on a regular, sporadic, or even 1-time basis. ID Number from the seller's Driver's License, Michigan State ID card, or other Photo ID card. Not gathering the required information for each transaction is a misdemeanor punishable by a fine of up to $500 and jail time of up to 93 days! To assist nonferrous metal buyers in gathering and storing this information, DCG developed IDGrab. IDGrab is a software application that interfaces with a thumbprint scanner and License/ID magnetic stripe reader (and/or full ID image scanner) to make it easy to capture and store a customer's Driver's License or State ID number, birth date, and a thumbprint in digital form to help with Act 429 compliance. It is intended to work with your existing methods of dealing with customers so that there are minimal changes to worry about. The user simply enters a Purchase Order number, check number, or other unique ID for the transaction and then swipes the customer's License/ID through one or both of the ID readers. The customer then presses their thumb to the digital thumbprint scanner (with no ink or other preparation required) to capture an instant digital image. All of this data is then stored in a database for as long as desired. Weekly reports can be generated for local police and other requirements as needed at any time. IDGrab runs on PCs with Windows XP, Vista, or Windows 7/8/10. It can be used as a single-computer stand-alone application or multiple copies can be used at the same time (including multiple thumbprint scanners and license/ID readers) and all share the same data. For offices that already have dedicated servers, IDGrab also supports storing data to a Microsoft SQL Server database. DCG can help with installation and configuration for any of these environments. IDGrab requires at least two open USB ports on each PC used for scanning. (Additional USB ports can usually be added to a PC, if necessary.) Yards decide if they want to use a magnetic stripe scanner or a full ID image scanner (or both) to capture the information from a license/ID. The magnetic stripe reader will capture the Driver's License or State ID number, birth date, and expiration date and store it in the database with just a swipe of the card through the reader. If the customer has been swiped previously, their information immediately appears, including the date of their last visit and thumbprint. 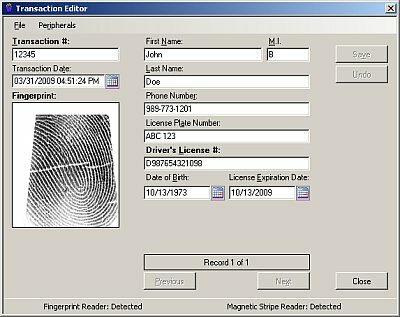 The optional full image scanner will capture a full color image of the entire front (and back, if desired) of the Driver's License or State ID and store it in the database. This method can be used without the magnetic stripe reader to meet the minimum capture requirements of the Act, but DCG recommends that both the stripe reader and the image scanner be used together to allow for enhanced ongoing customer visit tracking. No additional hardware is required for non-scanning PCs that are used only for searches and reporting. IDGrab uses approximately 300MB of storage for every 1,000 transactions (with thumbprints) recorded. The full image scanner option requires additional storage of approximately 1GB for every 1,000 transactions. The standard version includes support for the storage of approximately 32,000 transactions (with thumbprints) worth of historical data. This is usually plenty (several years worth) for most yards. Support for virtually unlimited historical data storage, for the few yards that require this, is available for an additional fee. Copyright © 2018 DCG, Inc.